Greenworks is rapidly becoming popular and slowly dominating the chainsaw industry. 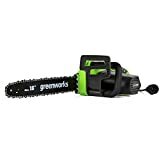 The Greenworks Chainsaws are changing the industry with the high creativity and innovation that gives you the power to seamlessly get the job of cutting tree branches and limbs done with minimal reliance on gas systems that produce extreme toxic emissions. Greenworks invest in customer satisfaction by providing quality products fitted with innovative features at affordable rates so as to give their customers value for money. All the five Greenworks chainsaws are powered using electric and battery power so users don’t have to worry about high elusive organic compounds, carbon monoxide, and nitrogen oxides emissions which harmful to the environment. They have made it their top priority to ensure all their products are eco-friendly, powerful, and reliable enough to help in the efficient handling of heavy-duty and medium projects. All the Greenworks chainsaws are ideal for DIY masters, professional gardeners, and garden fanatics. Their products are budget-friendly and ideal for handling almost all gardening and lawn care jobs. The saws use the brushless motor technology which aids increase torque production by up to 30% and reduces vibration by up to 70%. All these are intended to maximize efficiency and minimize on operation noise and production of toxic gases. So are the Greenworks’ Chainsaws Any Good You Ask? All Greenworks chainsaws both the cordless and corded options feature a tool-free tensioning. This essential features aid to ensure safe and efficient operation since it allows for easy adjusting of the saw tension without needing you to stop cutting to first remove the tool so as to tighten or loosen the chain. The soft case and scabbard features which are common among the Greenworks chainsaws help to maximize safety and protect your saw chain from getting damaged. Also, the Greenworks chainsaws use the powerful and efficient lithium batteries. The batteries are widely known for having low maintenance and having no memory loss after charging. The translucent oil tanks allow you to monitor oil flow and be in a position to tell when the oil is about to run out so that you can refill it. The Greenworks 10-inch cordless chainsaw is the real game changer in modern gardening. It delivers outstanding cutting performance and eco-friendly operation. 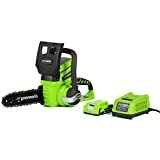 Running on the powerful lithium-Ion batteries, this Greenworks chainsaw is perfect for household cutting of branches and limbs, tree trimming, and making small cuts that can’t be made with larger alternatives. Greenworks 10-inch has an integral adjustment knob that allows easy tightening and loosening of the chain. It has an elongated 10-inch chain and bar that cuts through a variety of lengths and thicknesses. The oiler runs automatically to lubricate the arm and chain to boost the equipment efficiency and increase its lifespan. It is only 7.85 pounds so carrying it around when clearing limbs and brands won’t be a big issue. When handling large projects and would want to monitor oil levels to avoid disappointments, the translucent oil tank makes that very possible. As for the chainsaw’s batteries, they retain power for precisely longer hours which minimizes the hassle of having to stop once in a while to get the chainsaw charged. It excellently cuts through a variety of wood thicknesses. The 12-inch 40V is a smart cordless chainsaw powered by an efficient 40v Li-Ion battery. Featuring the robust 12-inch steel chain and bar, this chainsaw can cut through limbs and branches of different thicknesses and sizes. The tool-less chain tensioning system allows easy and fast adjustment to allow you get back to work the soonest possible. The high-performance 40V Lithium-Ion batteries deliver an excellent fade-free power and no memory loss when charged. It cuts with minimal kickback thanks to the 3/8-inch chain pitch. You don’t need to worry about durability as the automatic oiler takes care of all that by lubricating the chain and bar when necessary. To monitor the fuel levels and maximize optimal performance, the translucent oil tank gives you a clear view of the oil flow to ensure you can recharge it before it drains up. It weighs roughly 8.7lbs so handling and using it to cut limbs and branches don’t require you be physically fit. 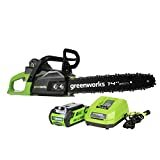 Greenworks 14-inch cordless is a premium chainsaw that optimizes on performance and eco-friendly operation. It uses a digital controlled brushless motor that guarantees extended run-time, more durability, quiet operation, and more torque. The handle is wrapped around which gives better control and ergonomics. The brushless motor is designed to deliver more than 30% torque to maximize quality and efficient cutting. It also minimizes vibration by up to 70% which optimizes cutting comfort by reducing fatigue. It is powered by the powerful Greenworks G-MAX 40V Li-Ion system that stores enough power allowing you make up to 100 cuts when fully charged. You will love this chainsaw not for anything else but due to it being lightweight and straightforward to handle. The saw comes with an oil gauge bar that lets you check the oil level and an automatic oiler that lubricates the chain and bar to maximize durability. The 2Ah batteries will take only one hour to fully charge while the 4Ah batteries charges fully within 2 hours. This means no matter how urgent the work in question is, you will get it done within the expected deadline. Due to the sturdy and rigid nature of the chain and chair, the chainsaw can handle both heavy duty and medium projects. It charges very quickly and lasts for long before the battery dies off. The handle is ergonomically designed to guarantee comfortable and quality handling. The brushless motors make the chainsaw more reliable, durable and more effective. It’s a lightweight and easy to use chainsaw that doesn’t require you to be physically fit to use it in cutting branches and limbs. The chainsaw is one of the most eco-friendly and highly-performing cordless choices in the market today. It is also one of the most pocket-friendly choices for heavy-duty and medium cutting. It doesn’t perform as powerful as a gas chainsaw. The Greenworks 20312 is a 16-inch heavy-duty battery chainsaw. It runs on two varied batteries that are the 40v Lithium-Ion and 40V G-MAX batteries. It’s so amazing how Greenworks uses the brushless motor to capitalize on enhancing the overall power and torque production of the chainsaw. The use of the brushless motor technology aids to minimize wear and tear as well as increase the tool’s run-time and lifetime. 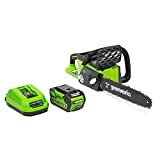 The 4.0 AH batteries offered together with these chainsaws promises higher performance and more power to let you get the trimming work done securely and free from the troubles of having to use extension cords. Something more amazing about this gardening tool is that it has 16-inch long chain and bar that guarantees quality cutting results even when used to handle big projects. You would want to miss this tool in your toolbox if you want to have easy and enjoyable cutting experience considering it has tool-less chain tensioning. The ergonomic design of the rear handles gives you optimum control over your tool during overhead use. As for the 3/8 chain pitch, it aids deliver outstanding cutting capabilities to let you seamlessly cut and trim large trees with fewer kickback issues. These chainsaws are extremely easy to start. They operate quietly and with minimum vibration. They guarantee amazing cutting performance. They are reasonably easy to handle and light in weight. There are no cords to worry about since the saws aren’t corded. They have excellent power for saws of their caliber. They require quality care for the chain tension to be maintained. The oil leaks when the saws stored. 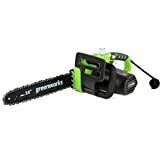 If you want an affordable and powerful chainsaw that can effectively clear fallen tree limbs, cut firewood or even cut timber, the Greenworks 18-inch corded chainsaw is what you need. This is an effective and reliable chainsaw that boasts a variety of excellent features that aims to help you get the work done safely, easily and quickly. 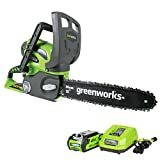 This corded chainsaw from Greenworks uses a powerful 14.5AMP electric motor that delivers excellent torque and solid cutting power to let you cut easily through huge tree branches and tree trunks. 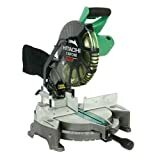 It comes fitted with a long 18-inch bar and chain that makes the tool more effective and reliable for handling heavy-duty and medium wood cutting jobs. Efficient operation and quality performance is maintained by the chain tension system. The saw features a tool-less tension adjustment system that works in an excellent way to let you easily adjust the known for it to cut more effortlessly and efficiently. Maintaining this amazing tool in perfect working condition doesn’t require lots of work since the automatic oiler aids to supply the chain and bar with adequate lubrication to keep them fully functional and free of toxic conditions that can lead to rusting and corrosion. It also aids ensure that the saw will operate seamlessly without overheating which can cause premature wear and tear. The chainsaw market is currently overcrowded. There are so many chainsaw brands, models, and choices from some of the world’s most reputable manufacturers such that it is a bit tricky to decide which one to choose. The most interesting yet confusing thing is that you will find positive reviews on almost each of these chainsaws. It is up to you to decide the chainsaw you will want to invest in based on your gardening needs, personal preferences, and budget. If you are a fan of the Greenworks chainsaws and have been wondering if they are worth the hype, we have outlined almost everything you need to know about these chainsaws. Our reviews will help you understand the areas where each of the chainsaws perform better and areas which may need to be improved for them to perform better.